could lead to a new treatment for MS.
Dr Ueli Nachbur, Associate Professor John Silke, Associate Professor Guillaume Lessene, Professor Andrew Lew and colleagues developed the molecule to inhibit a key signal that triggers inflammation. Multiple sclerosis is an inflammatory disease that damages the central nervous system including the brain, spinal cord and optic nerves. 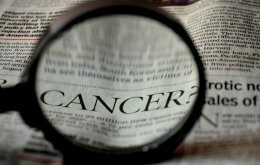 There is no cure and there is a desperate need for new and better treatments. 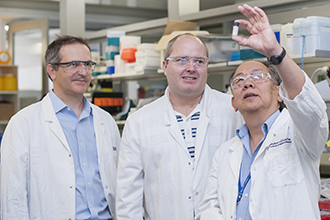 To apply the brakes on this runaway immune response, institute researchers developed a small drug-like molecule called WEHI-345 that binds to and inhibits a key immune signalling protein called RIPK2. This prevents the release of inflammatory cytokines. Professor Lew said they examined WEHI-345’s potential to treat immune diseases in experimental models of MS. Associate Professor Lessene, who developed the molecule with colleagues in the institute’s ACRF Chemical Biology division, said WEHI-345 had potential as an anti-inflammatory agent. “This molecule will be a great starting point for a drug-discovery program that may one day lead to new treatments for MS and other inflammatory diseases,” Associate Professor Lessene said. Dr Nachbur said institute scientists would use WEHI-345 to further investigate the signalling pathway that produced inflammatory cytokines and to develop a better, stronger inhibitor of RIPK2 for treating inflammatory disease. “This signalling pathway must be finely balanced, because WEHI-345 only delayed signalling rather than blocked it. Nevertheless, this delay is enough to completely shut off cytokine production,” he said. The research was published today in the journal Nature Communications. The study was funded by the Australian National Health and Medical Research Council, the Swiss National Science Foundation, the Australian Research Council and the Victorian Government.